《장고: 분노의 추적자》(Django Unchained)는 쿠엔틴 타란티노 감독의 서부 액션 드라마 영화이다. 제이미 폭스, 크리스토프 발츠, 리어나도 디캐프리오, 케리 워싱턴, 새뮤얼 L. 잭슨이 출연하였다. 북미에서는 2012년 12월 25일 개봉하였다. 서부 개척 시대와 디프사우스를 배경으로 하며, 해방된 노예 장고 (제이미 폭스)가 독일계 현상금 사냥꾼의 닥터 킹 슐츠 (크리스토프 발츠)와 함께 잔인한 농장주 캘빈 캔디 (리어나도 디캐프리오)에 맞서 빼앗긴 아내 브룸힐다 (케리 워싱턴)을 구하려고 하는 내용이다. 영화에 대한 평은 좋은 평을 받았으며, 미국 아카데미상을 포함한 수많은 시상식에 후보로 올랐다. 제85회 미국 아카데미상에서는 크리스토프 발츠가 남우조연상을 수상하였으며, 제70회 골든 글로브상, 제66회 영국 아카데미 영화상(BAFTA)에서도 남우조연상을 수상하였다. 감독인 타란티노 역시 골든 글로브상과 미국 아카데미 시상식에서 각본상을 수상하였으며, 1994년 《펄프 픽션》으로 각본상으로 첫 아카데미상을 수상한 이후로 두 번째로 받은 작품이 되었다. 영화는 흥행에도 성공하여 4억 달러의 수익을 냈으며, 타란티노의 영화 중 가장 수익이 많은 영화가 되었다. 2007년 쿠엔틴 타란티노가 데일리 텔레그래프에서 미국 디프사우스를 무대로 한 스파게티 웨스턴의 아이디어가 있다고 말했다. 타란티노는 제작 의도에 대해 "나는 계속 미국의 끔찍한 과거인 노예 문제를 다룬 영화를 제작하고 싶다고 생각했지만, 역사에 충실한 영화는 하고 싶지 않았고, 장르 영화로 그리고 싶다는 생각은 했다. 특히 미국의 웨스턴 작품은 극단적으로 노예 문제를 피해 그려온 작품이 많았다. 다른 나라들은 강제로 과거에 저지른 잔학 행위에 대해 국가별로 대처해야 해야했지만, 왠지 미국이 노예 문제에 관해서는 모두의 잘못으로서 파악해 아무도 제대로 이 문제를 바라보고 있지 않은 것 같다. "고 설명했다. 타란티노는 2011년 4월 26일 각본 집필을 완료하였고, 와인스타인 컴퍼니에 최종안을 제출했다. 2012년 10월, 자주 타란티노와 협업을 하던 RZA는 《장고: 분노의 추적자》와 그의 감독 영화 《철권을 가진 사나이》에서 크로스오버 기획이 있던 것을 밝혔다. 크로스오버의 내용은 RZA의 캐릭터가 젊은 시절 노예 경매에 나온다는 내용이었다. 하지만, RZA는 스케줄상 프로젝트에서 하차하였다. 1966년 세르조 코르부치 감독의 스파게티 웨스턴 《장고》에서 영감을 받았으며, 프랑코 네로가 카메오로 출연하였다. 노예가 전투 훈련을 받는 것은 1975년 영화 《만딩고》에서 영향을 받았다. 타란티노는 또한 눈에서의 장면은 《위대한 침묵》의 오마쥬가 포함되어 있다고 말하였다. 가디언의 인터뷰에서 "《위대한 침묵》은 눈 속에서 행해진다. 나는 그런 눈 속에서의 작업을 아주 좋아하고, 《장고: 분노의 추적자》 중간에 눈 장면이 있다. "고 말했다. ↑ “'Django Unchained' Slavery Depictions Not Nearly As Bad As Real History Says Quentin Tarantino”. Huffingtonpost.com. 2012년 12월 11일에 확인함. ↑ “'Django Unchained' Is Officially 2 Hours & 45 Minutes; Quentin Explains Why Frank Ocean's Song Doesn't Make The Cut | The Playlist”. Blogs.indiewire.com. 2013년 12월 6일에 원본 문서에서 보존된 문서. 2012년 12월 11일에 확인함. ↑ “DJANGO UNCHAINED (18)”. 《British Board of Film Classification》. 2012년 12월 17일. 2012년 12월 17일에 확인함. ↑ Raup, Jordan (2011년 6월 14일). “Quentin Tarantino's 'Django Unchained' Sets 2012 Release Date”. 《TheFilmStage.com》. 2012년 2월 2일에 확인함. ↑ Brevet, Brad (2011년 6월 14일). “Tarantino's 'Django Unchained' Set for Christmas Day 2012 Release”. 《RopeofSilicon.com》. Rope of Silicon LLC. 2012년 2월 2일에 확인함. ↑ “"Christoph Waltz Wins The Academy Award For Best Actor In A Supporting Role", Stories99, 2013-2-25”. 2013년 5월 10일에 원본 문서에서 보존된 문서. 2015년 1월 28일에 확인함. ↑ Dimako, Peter (2011년 6월 22일). “Jamie Foxx joins DJANGO UNCHAINED as lead for Quentin Tarantino”. 《Upcoming-Movies.com》. 2013년 10월 19일에 원본 문서에서 보존된 문서. 2012년 2월 2일에 확인함. ↑ 가 나 Weinstein, Joshua L. (2011년 6월 22일). “Jamie Foxx, Leonardo DiCaprio to Star in 'Django Unchained'”. 《TheWrap.com》. The Wrap News Inc. 2012년 2월 2일에 확인함. ↑ Cieply, Michael (2012년 7월 15일). “Spaghetti Surrealism Makes a Comic-Con Appearance”. 《artsbeat.blogs.nytimes.com》. 2012년 1월 7일에 확인함. ↑ Courtney O. (2011년 9월 14일). “Django Unchained Gets Samuel L. Jackson”. 《MovieWeb.com》. MovieWeb, Inc. 2012년 2월 2일에 확인함. ↑ Jagernauth, Kevin (2011년 10월 11일). “Don Johnson Joins Quentin Tarantino's 'Django Unchained'”. 《The Playlist》. indieWIRE. 2013년 6월 3일에 원본 문서에서 보존된 문서. 2012년 2월 2일에 확인함. ↑ Dimako, Peter (2011년 9월 28일). “Dennis Christopher joins DJANGO UNCHAINED”. 《Upcoming-Movies.com》. 2013년 10월 19일에 원본 문서에서 보존된 문서. 2012년 2월 2일에 확인함. ↑ White, James (2011년 11월 10일). “James Remar Joins Django Unchained”. 《EmpireOnline.com》. Bauer Consumer Media. 2012년 2월 2일에 확인함. ↑ 가 나 Gallagher, Brian (2011년 11월 10일). “Django Unchained Gets James Remar and Tom Wopat”. 《MovieWeb.com》. MovieWeb, Inc. 2012년 2월 2일에 확인함. 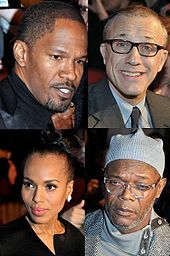 ↑ “Badass New Batch of Photos for 'Django Unchained' with Jamie Foxx”. 《FirstShowing.net》. 2012년 5월 28일. 2012년 6월 12일에 확인함. 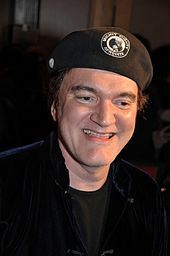 ↑ “Quentin Tarantino: I'm proud of my flop”. 《데일리 텔레그래프》. 2007년 4월 27일. 2012년 4월 14일에 확인함. ↑ Hiscock, John (2007년 4월 27일). “Quentin Tarantino: I'm proud of my flop”. 《Telegraph.co.uk》. 2012년 4월 16일에 확인함. ↑ Child, Ben (2011년 5월 5일). “Tarantino's Django Unchained script: The word is out”. 《GuardianNews.com》. The Guardian. 2012년 9월 16일에 확인함. ↑ Lyttleton, Oliver (2012년 10월 22일). “RZA Would Have Played His Character From 'The Man with the Iron Fists' In 'Django Unchained'”. 《indieWIRE》. 2012년 10월 26일에 원본 문서에서 보존된 문서. 2012년 10월 26일에 확인함. ↑ Child, Ben (2012년 6월 7일). “Django Unchained trailer: will Tarantino be a slave to the dialogue?”. 《Guardian.co.uk》. 2012년 8월 12일에 확인함. ↑ Bradshaw, Peter (2012년 12월 12일). “Django Unchained - first look review”. The Guardian. 2012년 12월 12일에 확인함. ↑ 가 나 Edwards, Gavin (2012년 12월 30일). “Quentin Tarantino: my inspiration for Django Unchained”. The Guardian. 2012년 12월 30일에 확인함. 이 문서는 2019년 4월 16일 (화) 06:41에 마지막으로 편집되었습니다.